In medical school this wasn’t one of the diagnoses I was taught I could make but on the other side of the doctor’s desk, this may be an even more dire diagnosis than a clogged gut. Last Sunday, in a suburban church in Montreal, this was the summary of the middle-aged chap who shared his life-long struggle of dealing with his past: “I don’t do emotions.” Me too! Well, no more. In many world cultures, that is the manly thing to do; it is macho. Some women try it too 🙂 In fact, in my own language, there is a saying that, “Obarima nnsu;” to wit, real men don’t cry. Even as a little boy growing up in Scripture Union circles in Accra, I always knew there was something wrong with that statement because I considered no one more manly that Jesus Christ yet he wept. Ever since then, I haven’t had a problem with weeping (you probably have seen me weep!) but errm… not done so well with a whole range of other emotions. I still remember my rather unemotional response to one of my staff’s emotional appeal when he said, “I feel…” My immediate response was, “Good thing that it’s only a feeling; but what do you think? !…” I don’t need to tell you that conversation didn’t go very well after that. The Lord has been particularly convicting me of my emotional immaturity since the beginning of this year. Prior to that, I was the kind of leader Ruth Haley Barton would describe in Parker Palmer’s words as having risen to leadership based on “extroversion, which means they have a tendency to ignore what is going on inside themselves. These leaders rise to power by operating very competently and effectively in the external world, sometimes at the cost of internal awareness… but the link between leadership and spirituality calls us to reexamine that denial of the inner life.” (Barton 2012, 44, emphasis mine). In fact, I might never have picked up a book like Peter Scazzero’s The Emotionally Healthy Leader because hitherto the word ‘emotional(ly)’ anywhere put me off. But for Dallas Willard and Scazzero, I had never thought of my emotional life as specifically needing to be discipled! I certainly did not have the theological, mental or practical framework for that! Scazzero astounded me and totally destroyed my perception of what spiritual formation consists of when he emphatically stated, “it is not possible to be spiritually mature while remaining emotionally immature!” (Scazzero 2015, 17). Gordon Smith drove the dagger deeper into my heart when he confirmed that “what is happening to us emotionally is not secondary to our spiritual experience, but may actually be—pun intended—the heart of the matter” (Smith 2014, 27). And whole squadrons of the ancients agree, that “few things are so crucial to our growth in faith, hope and love as our capacity to be alert to the emotional contours of our lives” (28). Smith then adds another dimension, that not only are my emotions an area to be discipled for sure but they are also indicative, a dashboard sign, in the sense that “the depth of our hearts reflects the depth of our emotional lives; nothing so captures the inner recesses of our beings as what is happening to us emotionally” (28). In fact, St. Ingatius exhorts that we check for feelings of consolation and desolation in the Examen. For all those as emotionally constipated as I used to be, we need to decide now: are we going to face our emotions, fight them or flee? So where do we go from here? Personally, I have not only devoured Scazzero’s The Emotionally Healthy Leader but also led my entire ISMC national leadership team and still taking the fourteen country CEOs of The HuD Group through it chapter by chapter. At ISMC’s recent biennial national staff conference in Montreal, there was a daily ‘Emotionally Healthy’ segment (spirituality, relationship, leadership). 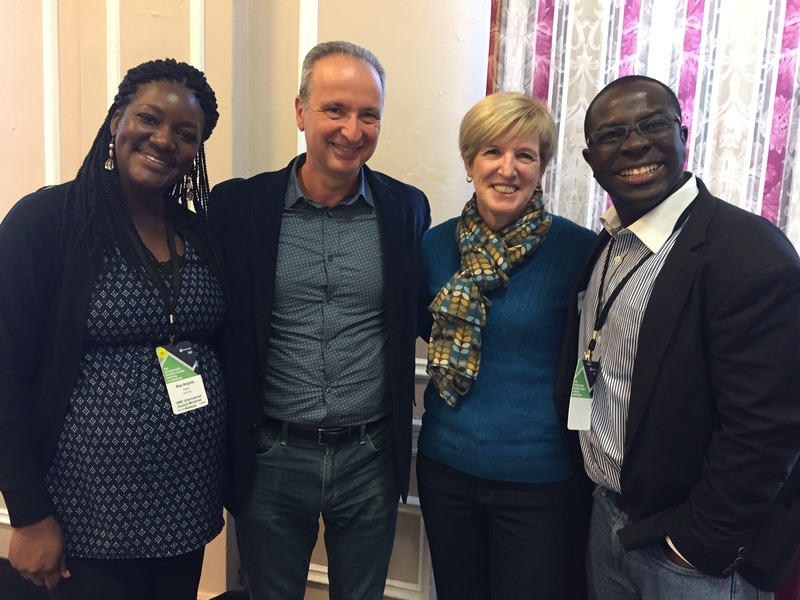 In fact, the picture you see above was taken in May 2017, when Anyele and I had the privilege of joining the authors, Peter and Geri Scazzero, at their conference in New York (together with the CEO of The HuD Group Canada and his wife). I’m still learning and eagerly walking with a few others through Emotionally Healthy Spirituality over the next few months. Barton, Ruth Haley. 2012. Pursuing God’s Will Together. Downers Grove, IL: IVP. Scazzero, Peter. 2014. Emotionally Healthy Spirituality Day by Day. Grand Rapids, MI: Zondervan. Scazzero, Peter. 2015. The Emotionally Healthy Leader. Grand Rapids, MI: Zondervan. Willard, Dallas, 2002. Renovation of the Heart: Putting on the Character of Christ. Colorado Springs, CO: NavPress.